The 2011 Port Townsend Woodworker's Show is over. Another great show and the best weather ever! We'll be holding the next show the first weekend in November in 2012. A huge round of thanks to Edensaw and Henery's Hardware for their sponsorship of the show. A big thank you to Joe Carey and everyone at the American Legion Hall for making the space available - we really appreciate the newly painted ceiling. Thanks, too, to the Port Townsend Leader and the Peninsula Daily New for great coverage on the show. Enjoy the pictures from the show. You can click through on he slideshow to look at or download full size images. $75 after September 7th, 2011. All applications must be received by 1 October, 2011. 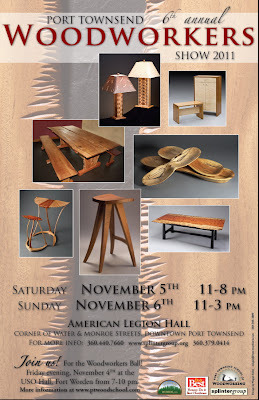 Images from the Woodworker's Show 2010: Mike Carroll's Slideshow: This next Port Townsend Woodworkers Show will be held at the American Legion Hall on Saturday 5th and Sunday 6th of November, 2011. The Port Townsend Woodworker's Show presents a wide variety of woodworkers from Port Townsend and the surrounding area. Furnituremakers, luthiers, gypsy wagon makers, lamp makers and more! Saturday 11:00am - 8:00pm (We're open during Gallery Walk so add us with a stroll towards the NW Maritime Center) Sunday 11:00 - 3:00pm Directions Directions from Google: Stroll round the neighbourhood!